Kids, I did it. 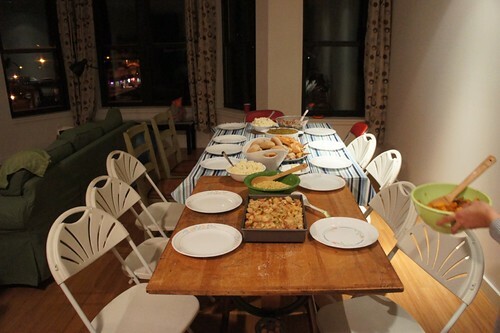 I have cooked a Thanksgiving feast for 11 people. It took a lot of thinking, planning, shopping and of course, cooking, but it was totally worth it. Photos courtesy of Andrew! Crunch time! 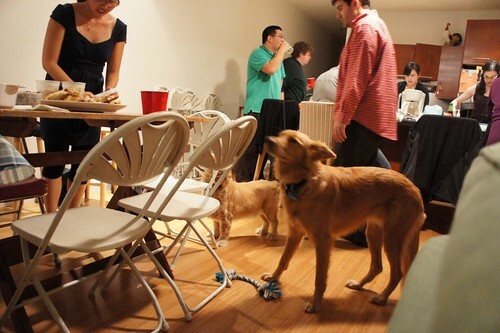 Kitchen's a mess, people are hungry! 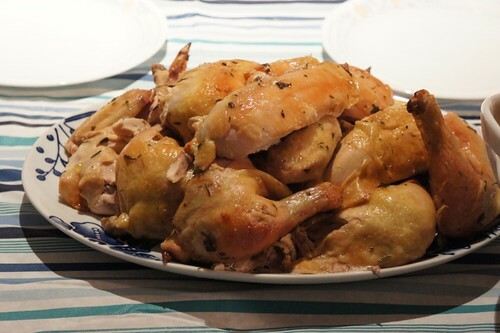 Herb Roasted Chicken – I used thyme, sage and rosemary for the rub. Before rubbing down the chickens, patted each one dry with a paper towel, then I squeezed some lemon juice over the chickens then stuffed them with the lemon, onion and garlic. 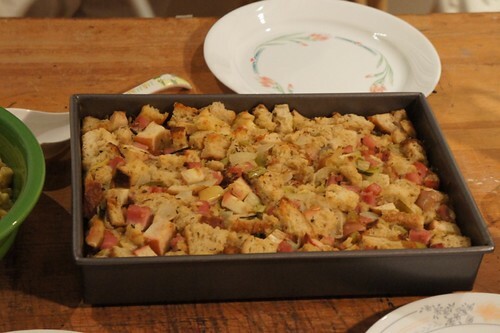 Sourdough Rye Stuffing with Ham and Cheese – I couldn’t find a loaf of Sourdough Rye, so I used part of a loaf of Rye and part of a loaf of Sourdough. Also, use a nice parmesan cheese. I used Kraft sawdust because I had it on hand. You couldn’t taste any of the parmesan. Roasted Veggies – To save time and oven space, I roasted the chicken on top of the veggies. Normally, this would work (and has many times). This time, I must have gotten some fat chickens, cause there was so much oil and grease on the bottom of the pan when the chickens were done, the veggies were not edible. 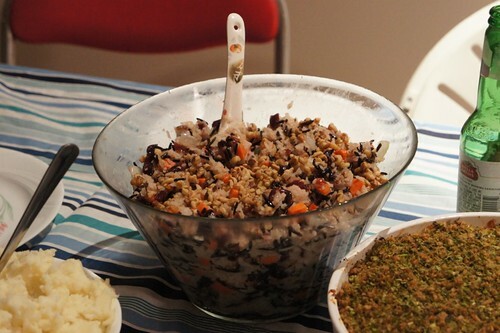 Wild Rice Pilaf (from Americas Test Kitchen cookbook) – A very good and very easy dish to make. Basil Broccoli Mac and Cheese – Mac and cheese with a twist! I mistakenly read three cups of pasta as three pounds. I was curious to why three pounds, but not curious enough to actually question it. It took me until the time when I was mixing the cheese mixture into the pasta to wonder if maybe I had too much pasta or too little sauce. I also roasted the butternut squash earlier, but completely forgot to add it back in. It didn’t matter, it was pretty darn good without it! Besides, the squash came in handy as a substitute for the lack of roasted veggies. 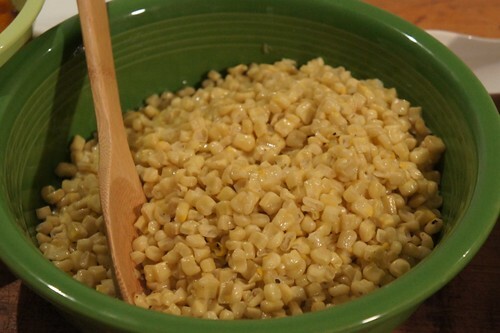 Corn – Nothing special. Frozen white corn from Trader Joes, defrosted and sauteed in some butter. 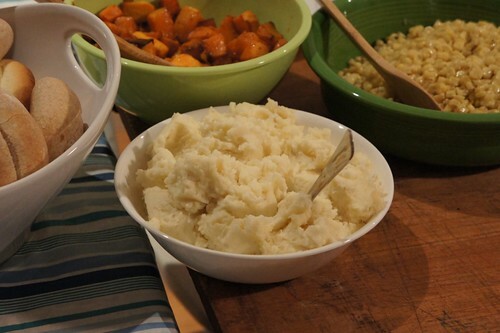 Mashed Potatoes – My friend Liz helped me out and made the mashed potatoes, taste tested by the mashed potato guru himself, her husband Ed. They were creamy and very delicious. As a starter, I served pork buns out of the Momofuku cookbook that I love making. 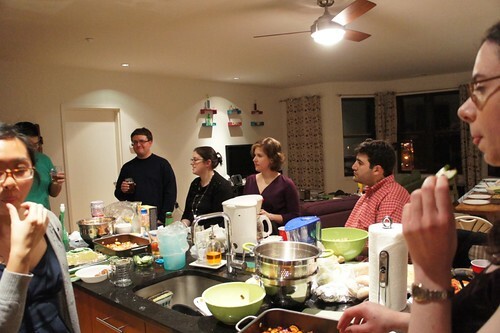 I keep raving about them, and now that I have the people I rave about it to under one roof, I was going to make them. 8 hours of cooking later (I run marathons so I can stay on my feet and run around a kitchen all day too), I was finished. Everything worked out great. 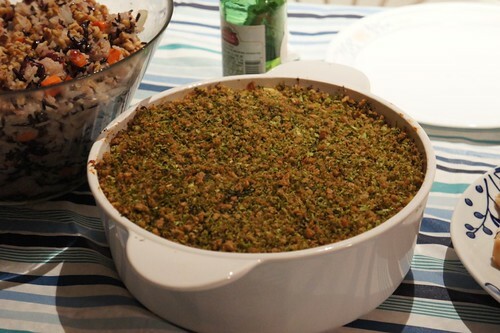 I can’t remember what time I finally had dinner on the table (I told everyone 7), but dinner was on the table. We all sat down, and as I looked down the table (which was really two tables) and saw everyone seated, I was thankful for everyone coming up for this and having such wonderful friends and family to cook for. I still have a tough time estimating how much food to make. I either make too little or too much, never have I made just enough. Tonight, I made too much. Leftovers for the rest of the week it is! and Ice Cream for a la mode by Shelley. Happy Thanksgiving everyone! Safe Travels to those who are traveling and happy cooking to those who are cooking! 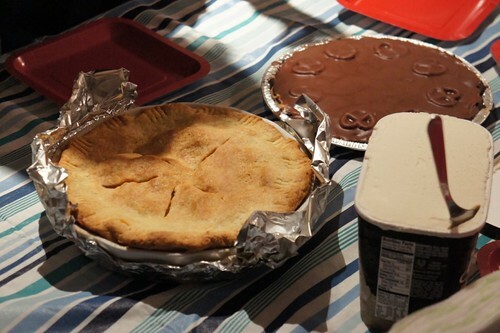 This entry was posted in Dinner and tagged chicken, Dinner, Mac and Cheese, pie, Rice, stuffing, Thanksgiving. Bookmark the permalink. 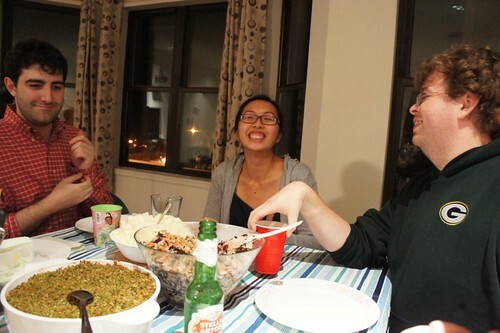 3 Responses to Pre-Gaming Thanksgiving Feast! 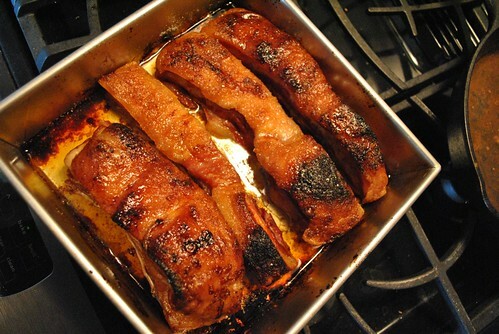 makes my mouth water all over again!